I believe what Frankl says is true for several reasons. First, I have witnessed the outcome of this in my own life. Whenever I find myself anxious or depressed due to some tension in my life, it’s most certainly a result of neglecting my Worthwhile Goal. I have experienced the “call of a potential meaning waiting to be fulfilled” and I know beyond a shadow of a doubt the direction my life is going. But once in a while—more often than I care to admit—I find myself forgetting my Worthwhile Goal. If I know this about myself, why let life’s tension and stress get me down? Recently, my wife asked me if I knew what was my biggest deterrent to living out my Worthwhile Goal. Initially, I didn’t have a great answer for her but after pondering her question for a day or two I came back and told her “Drama.” Drama with her, with my children, with my ex, or with friends and family puts me into a place of forgetting my Worthwhile Goal. She was right, and Frankl is right as well. Taking away the tension or stress isn’t enough for my life to have meaning. The days when I wake up with a sense of purpose have nothing to do with tension, stress, or “drama” that might have spilled onto my lap. Whether I have to go “punch in” at a job that’s not very fulfilling, work through difficult family issues, or spend my entire day getting lab work done at the hospital; my days are always filled with meaning as long as I take one step closer to fulfilling my Worthwhile Goal. Viktor E. Frankl might know a thing or two about what he’s saying here. If you don’t know, Frankl was plucked from his life and thrown into Auschwitz and other concentration camps. Finding meaning and purpose amongst such dire circumstances seems unfathomable. Frankl rightly quoted (and lived by) the words of Nietzsche: “He who has a why to live for can bear almost any how.” Don’t you find that true in your own life? On the days when there’s no drama, no time clock, or no stressful appointments or obligations we should all be stress-free, right? Yet, are we? There is a sense of relief when stress is absent but there is also a nagging feeling beneath the surface if we’re not pursuing our Worthwhile Goal. Once again, the absence of tension or stress does not equal Meaning. What about you? Are you struggling and striving for a Worthwhile Goal? If not, do you find yourself anxious or depressed at times? Have you considered that “a potential meaning waiting to be fulfilled” by you could be the answer to your questions? I believe many of us know our Worthwhile Goal but it gets lost along the way. Take a step today to get it back! One step forward is far better than standing still. Make that phone call, write that letter, inquire about opportunities you’ve been pondering. 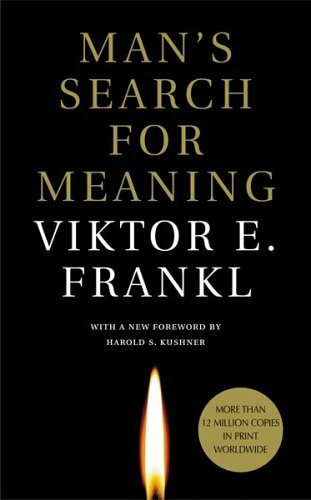 Man’s search for meaning is unique to every person. I can’t tell you what your Worthwhile Goal should be any more than you can tell me mine. But I do believe we can speak truth into each other’s lives so I’m encouraging you to figure out for yourself what is worth striving and struggling for. You won’t regret it. Drop me a line if you’re unsure and want to talk about your Worthwhile Goal. One of my goals is helping other people figure out theirs. Feel free to comment as well. Previous What I’m Learning . . .